So long Fresh Fruit Co.; hello Cedars & Co. After a two-year wait, Old Ottawa South finally has a new fresh food store. And though the fruit and vegetable selection is impressive, locals are also talking up the take-out counter and deli. Not surprisingly, given the name of the joint and that this is Ottawa, there is lots of Middle Eastern fare on the menu. Our current obsession? A decadent, freshly made baba ganoush from the deli case. Now this is not the regular baba ganoush (which is also available), but a more textured version of the familiar salad. No tahini involved. Instead, the roasted eggplant is mashed and blended with oil, vinegar, and lemon juice. 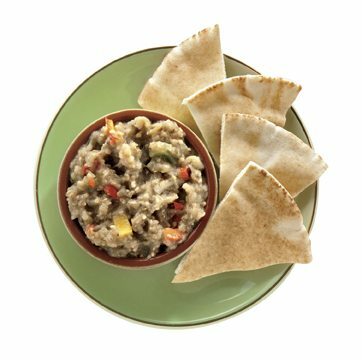 Slivers of spanish onion and chopped red and yellow pepper are stirred in to create a wondrous dip — the perfect condiment for your fresh pita. $3.99/250 g.
Cedars & Co., 1255 Bank St., 613-288-2797.